Looking Back, Over My Shoulder. Issue 109: Funeral For A Friend! Part 1. 11th April 1987. 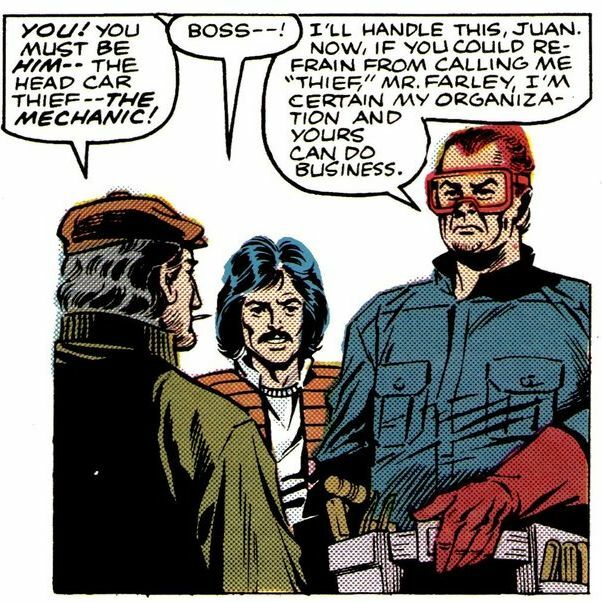 Juan, you short-sighted dolt! This is clearly not a typical vehicle! In theory the exclamation mark at the end of Funeral for a Friend should feel woefully inappropriate, this is after all an issue with some of the most serious and sombre moments Budiansky would ever write for the series. Not really the sort of high octane excitement suggested by a ! on the end of the title. But after he played it almost completely seriously in the previous story Uncle Bob falls off the wagon badly here and gives in to all his deepest and most depraved comedy human villain urges. That makes this an issue of two, very uneven halves. Luckily we open with the strongest material, as the gathered Autobots (in the American version including Skids but the UK team have taken advantage of him being on a black background to paint him out) watch Ratchet desperately try to repair and revive Optimus Prime. It's a very tense sequence, and rather smartly pulls a trick the Star Trek: The Next Generation episode Skin of Evil would repeat a year later: Having killed a main character they then attempt to trick you into thinking the doctor will perform their standard status quo restoring miracle working, only for them to fail utterly. It's cruel and clever and more affecting than Prime's actual death. Despite the title implying this is going to be about the send off for Prime, this is very much Ratchet's story. It's been a long time since he's featured prominently, but he's clearly a favourite of Budiansky's (he is, I believe, the only 1984 character to definitely make it to the end of his run unscathed. Soundwave comes close as well but gets Underbased near the end) and there's a sense here of the writer creating some stability in the midst of drastically changing times for the book by bringing one of the foundation stones of the series back to the fore. As is pointed out to him by First Aid (who was apparently too cool to try and help repair Prime), Ratchet is a military doctor and having to deal with fatalities is effectively a major part of his job. But Ratchet has never lost a patient like Optimus before; indeed in his rage he's almost dismissive of the "Gun-toting conscripts" he normally has to deal with. Optimus was a friend, mentor and inspiration, and his loss has completely broken the doctor. So rather than going to Prime's funeral, Ratchet decides to face his demons head on and try to do something for his many other patients. This is actually a seminal moment for the book as the idea the Ark has cold storage with "Dead" Autobots in suspended animation will become a major plot thread in later years, especially in Ratchet stories. 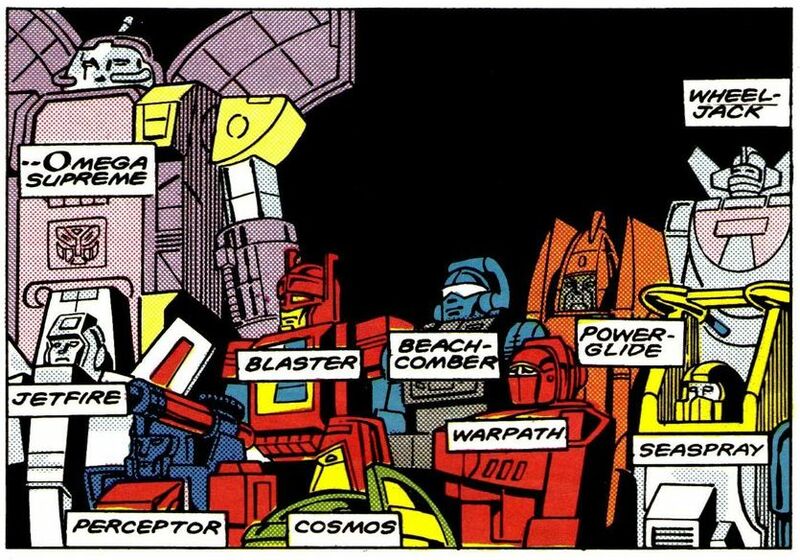 Who exactly is in the chambers is left fairly vague (though Gears and Bluestreak are amongst them), many of the original Autobots haven't been seen in the American stories since Prime got his head back but have continued to feature in the British adventures. Prowl however is definitely in there, and it's surprisingly affecting to see him dead on a table as Ratchet laments over him. This is a great opening to the story (oh, I suppose I should mention a minor subplot of Omega Supreme demonstrating the Ark's new automated defences as that'll be a thing next week) that creates the impression the sombre tone of the previous story is going to be maintained. In theory, the idea of Ratchet going to a scrap yard in order to get spare parts isn't a terrible one. It is a stretch- especially when it turns out that new police lights are essential for Prowl- but it shows Ratchet trying to deal with his grief in a nice proactive way. 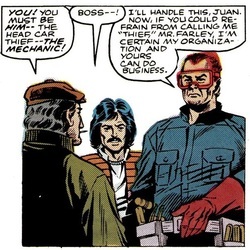 Unfortunately the yard is also the setting for a police sting to capture master car thief the Mechanic (and his sidekick Juan), a man who seems to have decided he's a super villain in a comic and as such should wear the stupidest costume he can manage, a boiler suit with Elton John glasses. The hijinks that ensue are a somewhat painful read, with the terrible two escaping the police by stealing Ratchet as he feels he can't just drive off whilst humans can see him (what happened to the facsimile constructs? ), with a massive cross-city chase following as Ratchet uses the tools in the back of his ambulance mode (were they there when real paramedics were using in at the end of issue 8?) to try and throw the coppers off. This, amazingly, turns out to be a bad idea as once they get to the Mechanic's lock up he starts stripping Ratchet of his goodies. The Autobot finally decides enough is enough, and Transforms to grab his stuff back, but it seems to be a little too late. 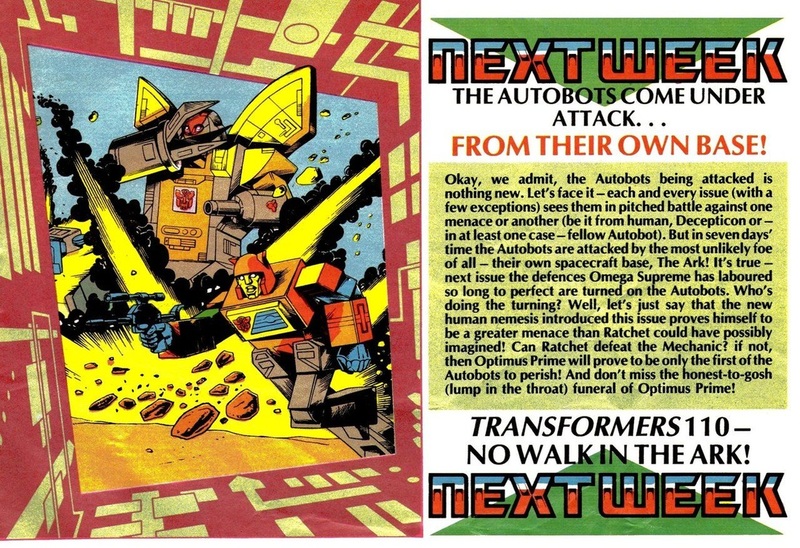 Thankfully two pages are switched to give a better cliff-hanger meaning we get to end on the start of Prime's funeral rather than Ratchet about to get pwnd. There's one nice idea in the Mechanic stuff, in that he's been in prison once before and now has such a fear of going back that seeing the police cars makes him freeze up. Other than that though, this second half of the issue is completely at odds with the first and destroys the sense of atmosphere it has carefully built up. It's almost as if Bob has randomly decided to sabotage his own story and will make you nostalgic for Joey Slick. This is especially frustrating coming off Gone But Not Forgotten! showing the writer at his very best. This issue: Not Truly Epic. 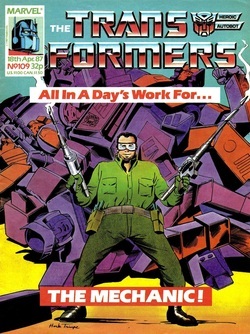 Transformation seems almost sarcastic in its praise of the Mechanic as an amazing new villain to join the likes of Circuit Breaker. You get a sense of the creative team's true feelings on the current run of American stories from the sidebar promoting the Rodimus Prime and Wreck-Gar toys, which assures us that these characters will be featuring in the next "Truly" epic Transformers saga starting in issue 113. The implication being that the current storyline, despite killing and replacing the leaders and also being a series of linked two parters, isn't really that epic at all. Philip Crowther Green from Reading has decided off his own bat to offer his services to Grimlock to have other readers write to him to pick their favourite elements of the 1986 stories for the first (and I believe only) annual poll of the comic. Not to be outdone, the fantastically named Jan Zeschky from Bridge of Weir suggests that a comic exchange be added to the Stock Exchange part of the page so readers can track down old issues. This will become an irregular feature and both show the level readers were invested in the comic by this point. Regular reader of this blog Auntie Slag pointed out in the comments a few weeks ago that Inhumanoids is basically Pacific Rim, and that comes over even more strongly here as two of our heroes (I must say that, even at this point, I can't keep track of which one is which) track one of the monsters underwater to its cave hideout before getting in a fight. Next week, we get the second memorial service for Optimus Prime in two months. Property Damage: 6 [Three police cars are sent crashing off the road].